The 50th Space Wing is a wing of the United States Air Force under the major command of Air Force Space Command. It was activated on 30 January 1992, replacing the 2nd Space Wing, which was inactivated on the same date. The 50th Space Wing wields space, cyberspace and expeditionary capabilities to deliver decisive global combat effects in support of national security objectives. It operates and supports satellite programs including the Global Positioning System, the Defense Satellite Communications System, Wideband Global SATCOM, Milstar, Advanced Extremely High Frequency, Space Based Space Surveillance, Tactical Satellite-3, Space Tracking and Surveillance System Advanced Technology Risk Reduction Satellite and the worldwide Air Force Satellite Control Network. The wing also operates satellite operation centers at Schriever AFB and remote tracking stations and other command and control facilities around the world. These facilities monitor satellites during launch, put the satellites in their proper orbits following launch, operate the satellites while they are in orbit, keep them functioning properly and properly dispose of the satellites at their end of life. Operates assigned DOD satellite systems, trains space operations crews, and provides operational support and evaluation functions for management of satellite operations centers and assigned ground stations. The group is composed of five active-duty and two Reserve squadrons, as well as one Air National Guard squadron. Commands and controls the AFSCN, manages and executes wing maintenance activities and provides communications-computer support for space operations missions and many other DOD, commercial and national missions. The group is composed of four squadrons, six detachments and the Program Management Office. Provides security, civil engineering, fire, personnel, contracting, force support and logistic readiness support to Schriever AFB. The group is composed of four squadrons and a flight providing base support of the wing's sites worldwide. North American F-86D-45-NA Sabres of the 496th Fighter Interceptor Squadron. Serial 52-3938 is in front. After the transition to the F-102 in 1959, this aircraft was transferred to the Japanese Self-Defense Air Force. The 50th Fighter Wing was established on 16 May 1949 as part of the post-World War II United States Air Force Reserve on 1 June 1949. The wing was formed at Otis AFB, Massachusetts. The 50th Fighter Group was assigned to the newly formed 50th Fighter Wing upon activation under the Hobson Plan. It trained in the Reserve between June 1949 and June 1951, being a corollary of the active-duty Air Defense Command 33d Fighter Wing. The wing was ordered to active service on 1 June 1951 due to the Korean War, and its personnel and equipment were reassigned as replacements to active-duty units. The 50th Fighter Wing was inactivated the next day, 2 June 1951. On 1 January 1953, the 50th Fighter-Bomber Wing was reactivated as part of the active-duty Tactical Air Command. The group was reactivated following Secretary of State John Foster Dulles' promise to provide NATO with four additional tactical fighter wings to increase its defenses against the Soviet Union due to the outbreak of the Cold War. The 50th Fighter-Interceptor Group activated as the 50th Fighter-Bomber Group (later renamed 50th Operations Group) and became the wing's primary combat element. The group's squadrons were equipped with North American F-86F Sabres, and training commenced for operational proficiency. Once training levels for pilots and aircrews had reached operational levels, the 50th FBW began preparations for its move to West Germany. On 10 August 1953, the 50th FBW arrived at its new home, the newly constructed Hahn Air Base. The 50th was assigned to the United States Air Forces in Europe (USAFE) Twelfth Air Force (12th Air Force). The wing became the first tactically operational Air Force wing in 12th Air Force's jurisdiction. The 50th FBG consisted of the 10th, 81st and 417th Fighter-Bomber squadrons. The first of the wing's new F-86H Sabres arrived at Hahn AB 21 October 1955. Conversion continued throughout the winter of 1955 and spring of 1956, ending in May. The 50th FBG received seventy-four F-86Hs, and also had two C-47 transports which were assigned to the Wing for courier and supply operations. The primary mission of the 50th FBW at Hahn was the delivery of tactical nuclear weapons against Warsaw Pact forces in the event of an invasion of Western Europe. Its secondary missions were tactical air defense and support for NATO ground forces. While 50th FBW prepared for and converted to the newer F-86H, the wing expanded its mission responsibility to include supporting 12th Air Force's 7382d Guided Missile Group. The wing had previously supported the 69th Tactical Missile Squadron at Hahn, which operated the MGM-1 Matador tactical missile. New aircraft would not be the only change for the personnel of the 50th, however. With the conversion to the F-86H nearly complete on 15 April 1956, the wing began a move to Toul-Rosières Air Base, France. The reason for the move was that USAFE war planners believed that due to the vulnerability of West Germany to Soviet attack, having nuclear-equipped fighter wings in West Germany made them vulnerable to being quickly overrun by Warsaw Pact forces. By moving them west into France, it would give NATO more time to respond. This movement took most of the summer of that year. The wing reported it was mission-ready at Toul-Rosières on 1 August. The 50th Fighter-Bomber Group was inactivated 8 December 1957 as a result of the 50th adopting the Tri-Deputate organization plan. As result of the group's inactivation, its operational squadrons—the 10th, 81st and 417th Fighter Squadrons were assigned directly to the wing. In 1957 USAFE also announced that the 50th FBW would receive the new F-100D Super Sabre. This advanced, supersonic aircraft significantly improved the wing's combat capability and enhanced European air defenses. The 50th FBW was the third and last USAFE fighter wing to convert into Super Sabres and converted to the new aircraft in 1957 and 1958. On 8 July 1958, it became the 50th Tactical Fighter Wing as a result of a worldwide USAF renaming convention, a designation it would carry for almost 35 years. At about this time, the wing updated its emblem to reflect its new mission and aircraft. The modified design depicted a griffin facing forward and breathing fire with its wings spread. An atomic "mushroom" cloud was centered behind the griffin. Behind the beast's right talon, an olive branch denoted peace. A lightning bolt behind the left talon symbolized the strength and power of the unit's aircraft. The wing would carry this emblem until its inactivation as the 50th Tactical Fighter Wing in 1991. Along with operating from Toul, the 50th TFW was tasked to support NATO Dispersed Operating Bases in France. In September 1959, with the completion of Luneville-Chenevieres Air Base, became the home of Detachment #2, 50th Air Base Group. Within a year of rearming with the new F-100s, issues with the runway at Toul AB began with severe surface cracking. This was caused by the weight of the F-100, which was almost double that of the F-86s formerly flown by the Wing. However, a much more severe problem was with the French Government. Political issues with France with regards to non-French military forces stationing nuclear weapons, or nuclear-capable units on French soil led to the United States moving the 50th TFW and other tactical wings out of France. Pferdsfeld AB, West Germany was initially considered as the new home of the 50th, however it was decided to return the wing to Hahn AB since it was only partially occupied at the time and the runway at Hahn had just been recently re-paved. The wing, its support units, 10th TFS and 81st TFS returned to Hahn AB, West Germany as part of Operation Red Richard. The 417th TFS was detached to the 86th Tactical Fighter Wing at Ramstein AB, West Germany. The 50th Tactical Fighter Wing reported its movement complete to Hahn on 10 December 1959. For the next several years, 50th TFW Airmen concentrated on becoming the best fighter unit in USAFE. During the Cuban Missile Crisis in October and November 1962, the wing hosted the 435th Tactical Fighter Squadron from Moron AB, Spain as part of a massive military buildup. After the Cuban Missile Crisis ended, the 50th TFW resumed normal operations and participated in various exercises and competitions, often with other NATO allies. By the mid-1960s, the Super Sabres were becoming vulnerable to a new generation of Warsaw Pact fighters, such as the Mig-21 and Sukhoi Su-15. In response, the wing's three tactical squadrons, the 10th, 81st, and 417th, began converting to McDonnell Douglas F-4D Phantom IIs on 8 October 1966. When the last F-100 left Hahn, 50th TFW aircrews had logged 143,147 flight hours. Throughout the conversion to the F-4D, the 417th TFS remained detached to the 86th Air Division at Ramstein AB. 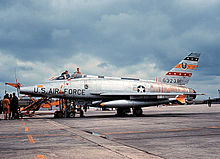 The 496th Fighter-Interceptor Squadron, attached to the 50th TFW but assigned to the 86th Air Division, did not convert to the new F-4D aircraft, instead flying the F-102 Delta Dagger interceptor aircraft. The wing underwent another organizational change on 15 July 1968. The costs of the ongoing Vietnam War were stretching defense budgets, and the costs of maintaining large United States forces (both Army and Air Force) in Europe, as well as the decision by France to withdrawal from the NATO integrated military alliance led to the development of "dual-based" forces, stationed in the United States, but deployable to NATO in case of a crisis with the Soviet Union. The 417th TFS was reassigned to Mountain Home AFB, Idaho, and was subsequently reassigned to Tactical Air Command's 67th Tactical Reconnaissance Wing. The 417th was "committed" to USAFE, and was planned to deploy to USAFE annually. To replace the 417th, USAFE reassigned the 496th Fighter-Interceptor Squadron back from 86th Air Division to the 50th Tactical Fighter Wing. The 417th, however, remained equipped with F-102 interceptors with an air defense mission. USAFE then selected the 81st Tactical Fighter Squadron as the command's first "Wild Weasel" surface-to-air missile suppression unit. The squadron's primary mission focus changed from ground and air attack roles to location and elimination of threats posed by enemy radar tracking and surface-to-air missile systems. The "Wild Weasel" version of the F-4E (and later the F-4G) could be used as a radar jamming platform or as a search and destroy vehicle. The 81st TFS moved to Zweibrücken Air Base, West Germany, on 12 June 1971. Though it remained assigned to 50th TFW, 81st TFS was detached from the wing's operational control and attached to the 86th Tactical Fighter Wing. Following these changes, the wing settled into a more routine operations tempo and returned its attentions to maintaining combat readiness. Within two years, USAFE redesignated 496th FIS as a tactical fighter squadron. The squadron converted to the F-4E Phantom, retiring its F-102s. The wing continued routine training operations throughout the 1970s. In 1976, the 313th Tactical Fighter Squadron was reactivated as a result of the 36th TFW at Bitburg AB receiving F-15 Eagles, and sending a squadron of its F-4E Phantom IIs to Hahn. In late 1978 USAFE announced that the 50th Tactical Fighter Wing would test and then field of the new F-16A Fighting Falcon. Arrangements for the tests began with arrival of the first of four teams in November 1978 and continued into 1979. Tests began 20 April 1979, with four F-16A Block 1 aircraft at Hahn Air Base, Germany. Meanwhile, prompted by the news of the its selection to receive the Air Force's newest fighter, the 50th TFW began construction of new hardened aircraft shelters, additional hangars, maintenance shops and support buildings. In addition contracts were issued for the construction of 300 additional housing units in communities near Hahn AB. Aircrews focused on training under a new graduated combat capability program that provided specific training events and competency levels for each category of crewmember. Maintenance personnel concentrated on learning F-16 specific requirements and adapted the Production Oriented Maintenance Organization to meet the needs of the new jets and mission. The 313th TFS accepted the first of the wing's new F-16s on 30 December 1981, after a vigorous acceptance inspection—a practice that continues today. Within six months, the last of the 50th TFW's F-4E Phantom IIs departed Hahn AB, after 16 years and more than 176,000 flight hours. A gala marked the addition of the Fighting Falcon to the North Atlantic Treaty Organization's arsenal on 9 July 1982. The ceremony included displays of aircraft from Norway, the Netherlands, Belgium, Denmark and other countries in the NATO alliance, all of which were programmed to receive the F-16. For the next several months, 50th TFW crews frequently deployed to Zaragoza Air Base, Spain, to conduct air-to-air and air-to-ground training. The training included events designed to improve bombing accuracy and increase air and ground crew performance. Before the 1983 Thanksgiving holiday, the wing would add yet another line to its list of accomplishments. That opportunity arrived in October, when 50th TFW crews took their F-16s to the Air Force's annual worldwide bombing and gunnery competition—Gunsmoke—where they won the overall competition. Additionally, one of the wing's pilots earned the individual Top Gun award. Personnel continued to demonstrate their excellence when one of the wing's weapons load crews earned first place distinction in USAFE and third place overall in an Air Force-wide competition at the end of 1983. Operational activity by March 1984 reached a fever pitch as the wing participated in several exercises and competitions and prepared for a brief deployment. The wing joined Green Flag exercises held at Nellis Air Force Base, Nevada, in March. Green Flag sought to provide realistic combat training with a heavy emphasis on electronic warfare such as anti-aircraft defenses' threat radars. At Hahn AB, other wing personnel participated in a NATO exercise. During this exercise, two 496th TFS F-16s conducted the first emergency procedures landings on an autobahn. The aircrews landed, refueled from dispatched trucks and launched from a highway near the German air base at Ahlhorn. The wing also prepared for a large-scale deployment to several air bases due to programmed runway repairs at Hahn AB. Aircraft and crews, maintenance specialists and support personnel deployed to Ramstein and Spangdahlem AB and to West Germany's Pferdsfeld AB from April to June 1984. The 50th Tactical Fighter Wing's growing list of accomplishments and recognition continued into 1985 when the wing received notice of its selection for an Air Force Outstanding Unit Award for the period 1 July 1982 through 30 June 1984. This was the fifth such award for the 50th. The 50th TFW's operational tempo did not slow, nor did the wing's receipt of accolades and recognition from its headquarters. The wing replaced its F-16A and F-16B Fighting Falcons for the advanced second-generation F-16C and F-16D in 1986. HQ USAFE announced on 15 April 1986, that the 313th Tactical Fighter Squadron had earned the USAFE Commander in Chief's Trophy for 1985. Operations and maintenance teams within 50th TFW also received numerous awards at major command level and higher throughout 1986 and 1987, including the Secretary of Defense's Phoenix Award recognizing the best maintenance organization in the Department of Defense. F-16C block 25 #85-1405 from the 10th TFS armed with Mark 84 2,000-pound bombs mounted under its wings and AIM-9 Sidewinder air-to-air missiles on its wing tips during the second wave of air attacks on Iraqi targets in support of Operation Desert Storm on 17 January 1991. By the end of the 1980s, the social, economic, and political turmoil in the Soviet Union had reached a boiling point. The Berlin Wall fell, and a new era in Europe began. Former Soviet republics proclaimed their independence and right to self-determination. Talk in Germany quickly turned to the possibility of reuniting East and West. Debate followed on the future role of American forces in Europe, and worldwide change loomed imminent. Throughout the spring and summer of 1990, the 50th TFW continued its aggressive training schedule. Meanwhile, American military and government officials debated the new role and structure of the armed forces in light of perceptions of a diminished threat to Western Europe. The changes brought about by events in the Soviet Union and in light of increasing public and governmental concern over the United States' increasing budget deficit. For many, the possibility of any combat activity seemed unlikely, but that perception changed almost in the blink of an eye during the autumn of 1990. While the wing's aircrews continued their normal operations in West Germany and Turkey, Iraqi president Saddam Hussein resumed a war of rhetoric against Kuwait. As the summer heat in Southwest Asia intensified, so did Hussein's war of words. Iraqi forces crossed the border into Kuwait on 2 August 1990, forcing the Kuwaiti royal family and existing government to seek refuge in neighboring countries. The United Nations condemned the invasion, calling for immediate withdrawal of all Iraqi forces from Kuwait. Returning to Hahn AB following an October 1990 training deployment to Zaragoza AB, Spain, 10th TFS commander Lt. Col. Ed Houle received notice to prepare his unit for possible deployment. Originally scheduled for a Thanksgiving Day movement, plans changed and called for the deployment of the 10th within 72 hours of the outbreak of hostilities, should that happen. As the final days of autumn passed and winter began, plans again changed. Word came that the 10th TFS would deploy on 15 January 1991, to fill out the combat strength of the fighter wing at Al Dhafra Air Base, United Arab Emirates. United States Central Command readjusted this date twice, finally establishing a deployment date of 1 January 1991. Meanwhile, crews continued to train and make other preparations. The 313th TFS selected six F-16Cs and eight pilots as potential replacements for lost jets and crews. Thirty F-16Cs left Hahn AB, for Zaragoza AB 29 December 1990. Six served as airborne spares to replace any of the original 24 that might not complete the trip to Al Dhafra. While hundreds of personnel at Zaragoza AB celebrated and welcomed the new year, thirty pilots of the 50th TFW fired their afterburners, drowning the sounds of celebration, and lifted into the darkness bound for the Middle East and the near certainty of combat. When they arrived, aircrews learned they would not employ the low-level procedures they had practiced for use in Central Europe. Instead of low-level ingress and 10- to 30-degree dive angles, they would deliver their payloads from nearly 20,000 feet with ingress angles near 60 degrees. As training progressed, crews from the 10th TFS began sitting alert with crews of the 17th and 33d TFSs, hoping that they might be the first to strike if war erupted. 15 January 1991, passed with Al Dhafra's crews and much of the coalition forces watching events unfold on cable television news. International news broadcasts, beamed via satellite, told of Iraq's refusal to withdraw and the resulting discussions on how the U.N. coalition would proceed. 16 January 1991 was much the same. Then, with a click of the second hand, Desert Shield became Desert Storm. At 4 a.m. local time 17 January, the first 40-plane strike package left Al Dhafra for targets in Iraq. The 10th TFS flew its first combat sorties of the war later that afternoon, led by squadron commander Lt. Col. Edward Houle. The assigned target for the eight-ship element of the 10th TFS was Al Taqaddum Airfield, near Baghdad—a round-trip of more than 1,400 miles and an eight-hour mission for crews accustomed to training flights of only one to three hours. For nearly six weeks, 10th TFS crews attacked Iraqi airfields, communication centers and military command centers. What few Iraqi fighters did fly were either shot down or chased across the Iraq-Iran border. After initial attacks against static targets, the 10th TFS crews received new orders. Iraq had begun using Soviet SS-1 Scud missiles in retaliation against the coalition's offensive air strikes, targeting both coalition forces and Israeli civilian population centers. In response, U.S. Central Command ordered search-and-destroy missions against Iraqi mobile and fixed SCUD launchers. Attacking those targets put 10th TFS pilots at greater risk. A good kill required locating and identifying the SCUD's associated radar once it was activated for launch, and the launchers were heavily defended. The squadron's first SCUD patrol mission began 19 January, only three days into Desert Storm. The mission changed again 23 January. With most of the strategic targets eliminated, the 10th TFS received orders to concentrate on Iraq's Republican Guard units occupying Kuwait and Iraq's southern region. For the Al Dhafra-based crews, this meant bombing any military targets on the road and destroying any pontoon bridges being constructed across the Tigris River. In addition, the wing's crews dropped leaflet bombs over Iraqi positions and civilian centers. For the next month, emphasis centered on counter-SCUD operations and preparing the battlefield for the eventual ground war. When the ground war began 25 February, crews began flying combat air patrols, protecting and supporting coalition ground forces. This mission, however, lasted only three days. On the morning of 28 February, the offensive ceased to allow Iraqi units to withdraw. After a brief interlude, crews returned to combat air patrols to enforce ceasefire accords that prohibited Iraqi aircraft from operating within defined areas. This provision of the ceasefire sought to protect coalition ground forces, U.N. personnel who would monitor Iraq's compliance with Security Council resolutions and civilian populations. With the return of deployed elements from Saudi Arabia in the summer of 1991, the 50th Tactical Fighter Wing was gradually inactivated during the balance of the year. With the reuniting of East and West Germany in October 1990, the Cold War threat of an invasion by the Soviet Union no longer was an issue. The United States was left with a huge excess capacity of expensive airfields in Europe. The 50th had performed its mission successfully in Western Europe and it was now time to end its mission. As a result, the 50th TFW was inactivated in 1991 after 35 years at Hahn Air Base. The 496th TFS was inactivated on 15 May; The 313th TFS on 1 July, and the 10th TFS on 30 September. The 50th Tactical Fighter Wing was inactivated on 30 September 1991. On 30 September 1993, Hahn Air Base was turned over to the reunited German government with the exception of a small portion used by USAFE as a communications site. However, Air Force officials soon reversed their decision to inactivate the 50th Tactical Fighter Wing. In 1982 Air Force Space Command was activated to control USAF space assets, which had previously been managed by Air Force Systems Command. As part of the general reorganization of the Air Force in the post–Cold War era. The 50th TFW was reassigned to the United States Air Force Space Command, which reactivated the wing as the 50th Space Wing on 30 January 1992, at Falcon Air Force Base east of Colorado Springs, Colorado. The 50th was reactivated as part of the USAF Heritage Program, in which notable historic wings remained on active duty, replacing younger ones. The 50th Space Wing assumed control of the personnel and assets of the 2d Space Wing, which was immediately inactivated. At the same time, the command activated the 50th Operations Group, the redesignated World War II and early Cold War-era 50th Fighter Group, and assigned it to the 50th Space Wing as part of the post Cold War USAF Objective organization plan. AFSPC also activated the 50th Maintenance and Supply Group and the 50th Combat Support Group under new names, creating a wing organization that closely resembled that of the 1950s. Squadrons assigned to the 50th concurrent with its activation included a mixture of past units and those previously assigned to the 2d Space Wing, which the 50th SW replaced. The command activated the 50th Mission Support, Civil Engineering, Security Police, Communications, Airdrome, Air Service, Depot Repair and Depot Supply Squadrons with new designations. Transferred from the 2nd Space Wing were the 1st, 2nd, 3rd and 5th Satellite Control Squadrons, renamed Space Operations Squadrons. The headquarters of the 2nd Satellite Tracking Group became Headquarters 750th Space Group and transferred to 50th SW. The 50th SW also assumed responsibility for a number of detachments operating around the world. The 50th SW assumed command-and-control responsibilities for several existing satellite constellations that provided a variety of critical information to the Air Force, Department of Defense and other users. Additionally, the 50th SW assumed responsibility for the Air Force Satellite Control Network, which allowed satellite controllers to fly satellites under their command. Continuing activity resulting from the 1995 Defense Base Closure and Realignment Commission (BRAC) report resulted in the inactivation of the 750th Space Group and the 5th Space Operations Squadron at Onizuka Air Force Station, California, in 1999 and 2000 respectively. The inactivation of other agencies and units at Onizuka AFS left 21st SOPS as the installation's host, and the 21st SOPS commander assumed installation commander responsibilities. The 50th Space Wing supports allied operations in Southwest Asia with satellite communications, GPS enhancements and deployed personnel. By 2005, the 50th SW averaged 80 Airmen per month deployed to forward operating bases in Afghanistan supporting the Global War on Terrorism. During Operation Iraqi Freedom 2d SOPS crews developed new techniques for enhancing GPS accuracy over the Iraqi theater of operations and flew more than 1,000 satellite sorties between 20 March and 10 April. The 1st SOPS set a record during this period, placing a GPS satellite in orbit and completing all early on-orbit checkout activities in only 11 days while also flying 100 Defense Support Program satellite sorties and 300 GPS sorties in the first 20 days of combat. Third and 4th SOPS crews maximized satellite communications coverage of the theater. The 3rd SOPS' Defense Satellite Communications System Block III satellites provided 80 percent of in-theater bandwidth. Meanwhile, 4th SOPS dedicated 85 percent of Milstar communications capability to the war effort, flying 14,000 sorties in the first 20 days of operations. The 50th Network Operations Group (previously the 50th Communications Group) supported all of the wing's satellite command-and-control activities through the Air Force Satellite Control Network scheduling nodes, managed by 22nd SOPS. Personnel at the wing's remote tracking stations, including 21st SOPS at Onizuka AFS and 23rd SOPS at New Boston AFS, N.H., logged more than 12,312 satellite contacts while assisting with other satellite operations and three satellite launches. The 50th SW also underwent organizational changes in the first years of the new century. To correct inefficiencies and realign organizations along mission lines, Air Force Space Command renamed the 50th CG as 50th NOG and reassigned 21st, 22nd and 23rd SOPS to that organization. Functions of the 850th Space Communications Squadron merged with those of 50th SCS, and the 850th SCS inactivated in January 2006. 9th Tactical Fighter Squadron: attached 11 September–7 October 1971, 23 September–24 October 1976. 69th Pilotless Bomber Squadron (later 69th Tactical Missile Squadron): attached 14 March 1955 – 15 April 1956. 81st Fighter-Bomber Squadron (later 81st Tactical Fighter Squadron): 8 December 1957 – 15 July 1971 (detached 15 June-15 July 1971). 417th Fighter-Bomber Squadron (later 417th Tactical Fighter Squadron): assigned 8 December 1957 – 1 July 1968, attached 1–15 July 1968, 15 January-4 April 1969, 11 September-10 October 1970, 9 September-2 October 1971, 5 February-8 March 1973, 6 March-5 April 1974, 3 October-5 November 1975, and 24 August-26 September 1976. 430th Fighter-Bomber Squadron: attached 20 April-7 October 1956. 458th Tactical Fighter Squadron: attached c. 13 August 1958-c. 18 February 1959. ^ a b c d e f g h Robertson, Patsy (20 November 2008). "Factsheet 50 Space Wing (AFSPC)". Air Force Historical Research Agency. Retrieved 1 December 2016. ^ a b c d e f g h "Schreiver Air Force Base: 50th Space Wing". 50th Space Wing Public Affairs. 20 November 2008. Archived from the original on 21 October 2013. Retrieved 2 December 2016. ^ a b Saunders, Randy (29 November 2006). "From 'Master of the Sky' to 'Master of Space': 50th FW moves to USAFE, active duty". 50th Space Wing History Office. Archived from the original on 5 April 2014. Retrieved 2 December 2016. ^ a b c Saunders, Randy (29 November 2006). "From 'Master of the Sky' to 'Master of Space': 50th gets Sabres, begins tour at Hahn AB". 50th Space Wing History Office. Archived from the original on 5 April 2014. Retrieved 2 December 2016. ^ a b c d e f g h Saunders, Randy (8 December 2006). "From 'Master of the Sky' to 'Master of Space': 50th FW moves 'there and back again'". 50th Space Wing History Office. Archived from the original on 5 April 2014. Retrieved 2 December 2016. ^ a b c d e f g h Saunders, Randy (1 May 2007). "From 'Master of the Sky' to 'Master of Space': F-16s join 50th TFW arsenal". 50th Space Wing History Office. Archived from the original on 5 April 2014. Retrieved 2 December 2016. ^ a b c d e f g h i j k Saunders, Randy (3 May 2007). "From 'Master of the Sky' to 'Master of Space': 50th TFW flies, fights, wins in Desert Storm". 50th Space Wing History Office. Archived from the original on 5 April 2014. Retrieved 2 December 2016. ^ a b c d Saunders, Randy (27 June 2007). "From 'Master of the Sky' to 'Master of Space': 50th TFW gains new life, new mission in ultimate high ground". 50th Space Wing History Office. Archived from the original on 5 April 2014. Retrieved 2 December 2016. ^ a b c d e Saunders, Randy (26 June 2007). "From 'Master of the Sky' to 'Master of Space': 50th SW faces new millenium, new war". 50th Space Wing History Office. Archived from the original on 5 April 2014. Retrieved 2 December 2016. ^ a b Bramun, SSG Don (24 May 2007). "50th Space Wing welcomes new commander". Schriever.af.mil. Archived from the original on 5 April 2014. Retrieved 2 December 2016. ^ Bramun, SSG Don (12 June 2008). "50th Space Wing steps into future with new commander". Schriever.af.mil. Archived from the original on 5 April 2014. Retrieved 2 December 2016. ^ Foster, SSG Stacy (26 August 2009). "Schriever welcomes neighbor as 50 SW commander". 50th Space Wing Public Affairs. Archived from the original on 5 April 2014. Retrieved 22 May 2011. ^ Reid, Mike (7 May 2009). "50th Space Wing: #1 wing in AFSPC". Colorado Springs Military Newspaper Group. Retrieved 16 April 2017. ^ Wade, Daniel (4 May 2009). "The Excellence of Space and Missile Wings Recognized". 50th Space Wing Public Affairs. Archived from the original on 5 April 2014. Retrieved 2 December 2016. ^ Thibault, Jennifer (17 May 2011). "50th Space Wing earns Omaha Trophy". 50th Space Wing Public Affairs. Archived from the original on 5 April 2014. Retrieved 2 December 2016. ^ Prater, Scott (16 April 2013). "50 SW earns second Omaha Trophy". Schreiver Sentinel. Archived from the original on 5 April 2014. Retrieved 2 December 2016. McAuliffe, Jerome J. (2005). "16, Toul-Rosieres Air Base". U.S. Air Force in France 1950–1967. San Diego, CA: Milspec Press. ISBN 978-0977037117.